This is David's tuxedo. Unlike most grooms, there's no renting for him; he bought his. 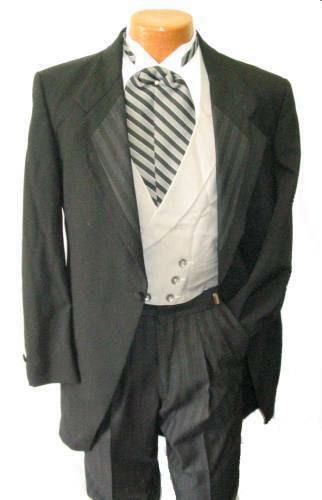 This elegant "Eternity" from After Six formalwear was found on eBay. It's a cutaway with an ascot tie. This type of tuxedo is normally preferred for ultra-formal morning weddings. Our wedding is not ultra-formal or morning, but this elegant suit is David's favorite style (once upon a time, he worked at a tuxedo shop). It will also go very well with Elaine's dress. To see what the best man and groomsmen will be wearing, visit the Wedding Party Outfits page! Click here to see preview shots of Elaine and David wearing their wedding attire together!